Mapbox joined last weekend’s Rio mapathon to help map the city where this year’s Olympic Games will be held. In the OSM wiki, the voting for the “extended Kneipp water cure” tagging proposal has started. There’s a large discussion on the tagging mailing list about the different restrictions for learner drivers that exist in different countries (another new wiki proposal). Mapbox has developed a JOSM plugin to allow the tagging of turn lanes. It implements the current turn:lanes scheme which was also used during the German Weekly task. Martin Koppenhoefer wonders whether the amenity=nursing_home tagging is really deprecated (as someone has marked the wiki page) or if it still sometimes makes sense to use it. Mapbox Bengaluru conducted a satellite workshop which involved imagery processing using QGIS. The tutorials related to the workshop can be found here. On the 13th of July there will be a GraphHopper meetup in Berlin. The schedule of SotM 2016 Japan (August, 06) has been published. (automatic translation). On the Humanitarian OpenStreetMap Team’s blog there is a report about a mapping workshop which was held at the end of April in Uganda. This very detailed map of Bexhill (UK) by Dr-Mx is available on github. It is a fork of the Spanish language upoi.org by Manuel Kaufmann aka humitos. Josh Cohan (Next City) describes a new “AccessMap Seattle” map, currently accessible as a beta version. Parts of Seattle are very hilly, and AccessMapSeattle shows that, and other barriers to accessability. The map is of course using OSM data. A new version of OpenRouteService has been released. Timothy Ellersiek describes it here in the University of Heidelberg’s GIScience News Blog. Caleb Pershan writes in SFist about some special “typographic” maps of American cities that have been created. All municipalities, roads, and water areas are exclusively represented in writing, and all are OSM based. The city of Bonn has made a CC0 dataset available containing the location, type and age of urban trees. The coordinate system does need a little conversion, but that is described here by Josef Schugt. A diary entry by BushmanK with rebuttals. A thread on the Spanish mailing list – (automatic translation) that explains how to identify potentially problematic MAPS.ME edits. How to handle Maps.Me garbage? Kepta, who is working on lane tagging support for the iD editor, explains in several blog posts about the progress that he is making. The Routing API of GraphHopper has just received a bunch of new features. Mapzen was able to “prevent a new war” between Sweden and Denmark (due to their geocoder misclassifying Copenhagen as in Sweden). … the EmojiMap by Merten Peetz? … Le Portail IGN, a site for map comparisons? It’s similar to BBBike’s Map Compare, but has some different maps. …about the Mexican project Mapeaton. 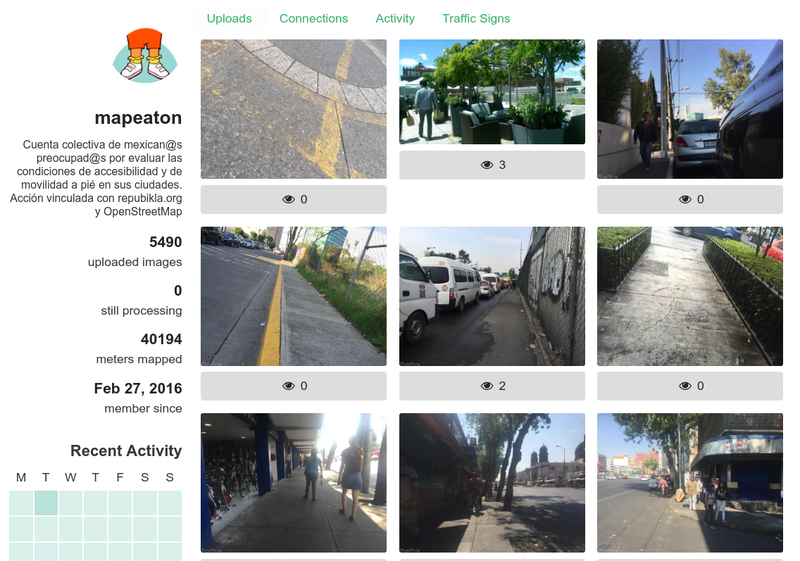 A Mexican pun on the words “mapathon” and “peaton (pedestrian)”. The project’s aim is to take pictures of problems related to infrastructure for pedestrians. GeaCron has published an interactive political world map which allows you to travel through the centuries. It’s a bit Eurocentric (I doubt much of the Americas and Asia were uninhabited 400 years ago) but it’s fun nonetheless. Mapzen is hiring a “tiles engineer” in San Francisco or New York. Experience with OpenStreetmap is apparently a “bonus”! Watch as the world’s cities appear one-by-one over 6,000 years (a visualisation by Metrocosm). Mumbai’s “Mid Day” newspaper contains an article about new cartographers visualising individuality in maps (based on volunteer-led mapping and OpenStreetMap data). Note: If you like to see your event here, please put it into the calendar. Only data which is there, will appear in weeklyOSM. Please check your event in our public calendar preview and correct it, where appropiate.. This weekly was produced by Hakuch, Laura Barroso, Nakaner, Peda, Polyglot, Rogehm, SomeoneElse, derFred, escada, jinalfoflia, malenki, mgehling, seumas, widedangel.